The Sidi Mohammed Ben Abdellah University of Fez was founded on 16 October 1975 and is one of the oldest and most prestigious universities in the Kingdom of Morocco and has undergone significant expansion both in terms of its structure and number of institutions (12 institutions) and in terms of the number of teachers, researchers, administrative staff and students. 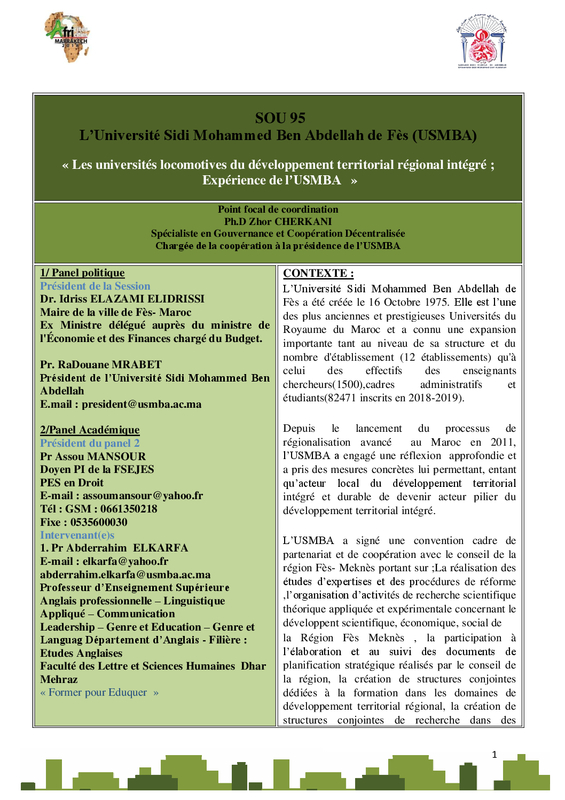 Since the launch of the advanced regionalisation process in Morocco in 2011, USMBA has been considering becoming a key player in integrated territorial development and has signed a framework partnership and cooperation agreement with the Fez Meknes Regional Council on;The carrying out of expert studies and reform procedures, the organisation of applied and experimental theoretical and theoretical scientific research activities concerning the scientific, economic and social development of the Fez Meknes Region, the participation in the elaboration and follow-up of strategic planning documents produced by the MFRC, the creation of joint structures dedicated to training in the fields of regional territorial development, the creation of joint research structures in themes and programmes on the region, the creation of grants to encourage research work, the organization of training courses for elected officials and civil servants of the region, the organization of conferences and scientific meetings and the exchange of documents and information concerning each party. This partnership relationship has made USMBA an actor in territorial development, an instrument for close consultation and monitoring of the integrated regional development process. This session will present the experience of USMBA and the local and regional authorities of the region to which it belongs and will review the actions already undertaken and the prospects for cooperation.